As foreseen by MARPOL 73/78, Revised Annex I, Reg. 37, par. 2.5.3.2.1 every vessel has to be enrolled in a ship specific salvage software designed for quick salvage response in case of a casualty. If the casualty involves grounding, breaching of the outer hull with subsequent flooding or other structural damage for which calculations of stability and damaged longitudinal strength are beyond the ship's recourses, assistance must be sought from shore by the firm designated for Damage Stability and Emergency Response Services on a ship specific basis. 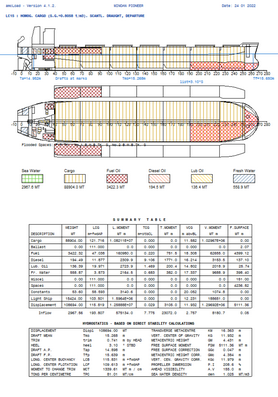 We can undertake this salvage response support using the approved salvage response program (HECSALV ship salvage engineering software), approved by all the classification societies, which enables to rapidly evaluate damage conditions of the ship (features include the ability to analyze the intact condition, free flooding damage cases and various types of stranding). During a vessel emergency your most valuable assets are time and confidence. Starting with the last known departure condition, HECSALV allows for quick data collection and multiple scenario process evaluation for remedial action. Our services for damaged condition seaworthiness calculations are on a 24-hour basis. It is hoped that it will provide guidance to ship operators and master on the type of information that would be required by a shore organization in order to make calculations on damage longitudinal strength or damage stability which are beyond the resources of the ship.